Death of Demeter: Putting an old dog down. You will notice that Demeter’s rear leg is splayed out in an abnormal position, rather than being tucked under, or parallel to, her body. This was one of the last photos that I took of her. 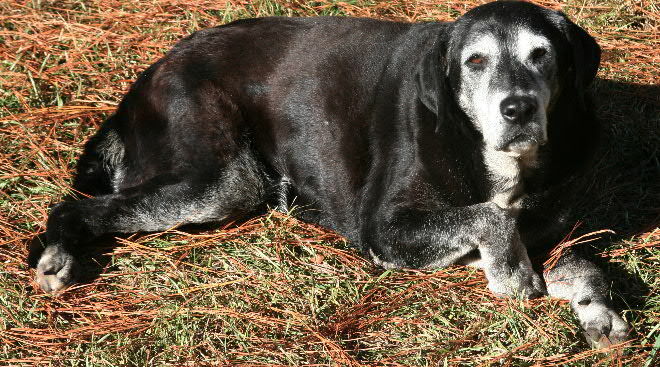 When you have a 14 1/2-year old dog that has been a companion for both you and your late wife, an always-eager hunting buddy and protector of the homestead that has serious physical issues; a point comes when it is time to end the dog’s life, rather than have it struggle through an inevitable decline. Such decisions are always difficult. The progression of Demeter’s hip dysplasia started about two years previously. At first she was stiff after going into the woods, but would recover overnight. Then her recovery period became longer – it took two to three days for her to rebound. Oral medications were tried and this helped somewhat, but did not stop the degenerative condition. At this stage with overweight dogs, taking some of the weight off the dog can have remarkable results as was the case with another of my dogs, a yellow Lab named Ursus. I gave him to a friend. I had already switched him to a reduced-calorie dog food, and had taken some pounds off him. Bill continued this process with a total drop of tens of pounds from the dog’s frame. Ursus blew out a rear knee-joint while chasing a cat and had a nearly $2,000 surgery to correct it. Now with reduced weight and a repaired knee, he is acting like he is years younger. This was a remarkable improvement in his quality of life compared to where he was before. 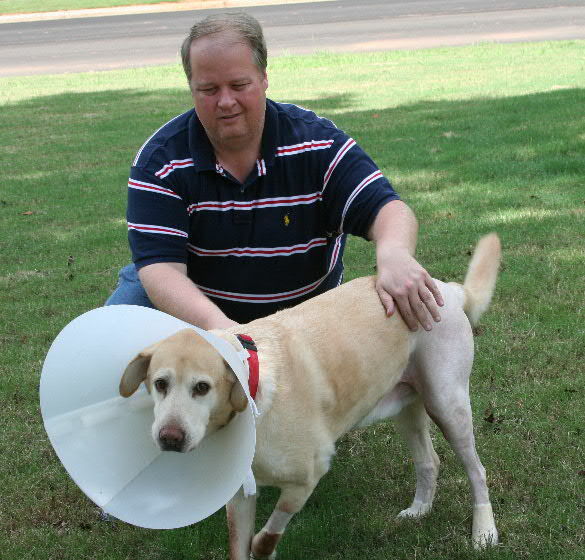 Ursus and Bill Krantz immediately after surgery on the dog’s left rear knee-joint. Demeter, on the other hand, continued to decline. Although she also lost weight, this was never as serious problem as it was with Ursus. She wanted to go to the woods with me, and I had to lock her up to keep her from following me and stressing her joints. It became more difficult for her to climb the six steps to get into the house or step over anything more than 4-inches-high. It was clear that it was not one hip that was giving the problem, but both of them. 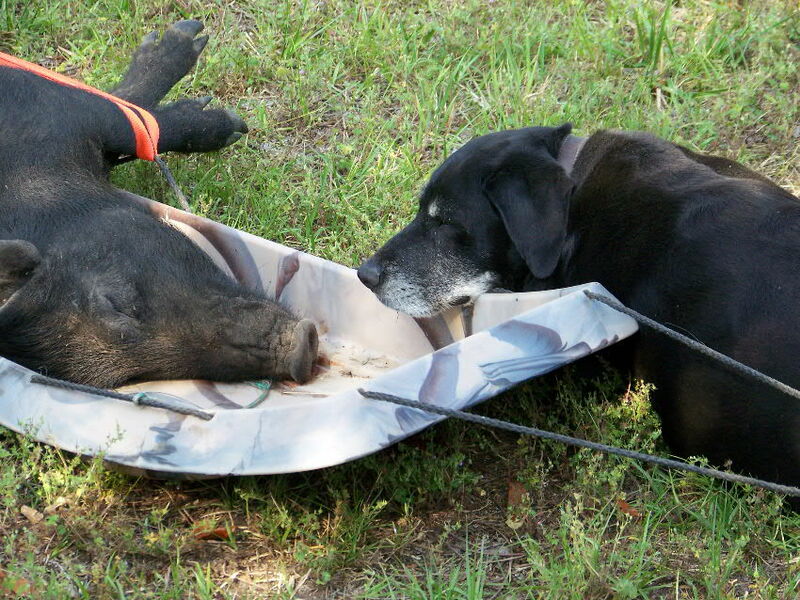 Although most people think of Labs as duck dogs, I mostly use mine for helping to find and recover game, as here where Demeter guards “her” hog. At the last check-up at the vet, she had to be carried because her rear legs would not support her on the slick linoleum floor. The same was true in my kitchen. I knew the time had come when she had to drag herself across the kitchen floor with her front legs. She did not cry in pain as she did this, but clearly she had lost leg strength. It was now impossible for her to climb steps, and I had to carry her into the house. Although I knew what the answer would likely be, I consulted with my vetinarian, Dr. Christine Evans, about Demeter. I got the dog from her, and she had cared for Demeter all of the dog’s life. The options were I could take her in and they would administer a fatal dose of a sleeping drug, or she would come to my house and do it. This is a controlled substance, and she could not give it to me to administer. Demeter had a full life as a free-ranging country dog and is shown here enjoying boiled deer bones with Ursus and Diana. 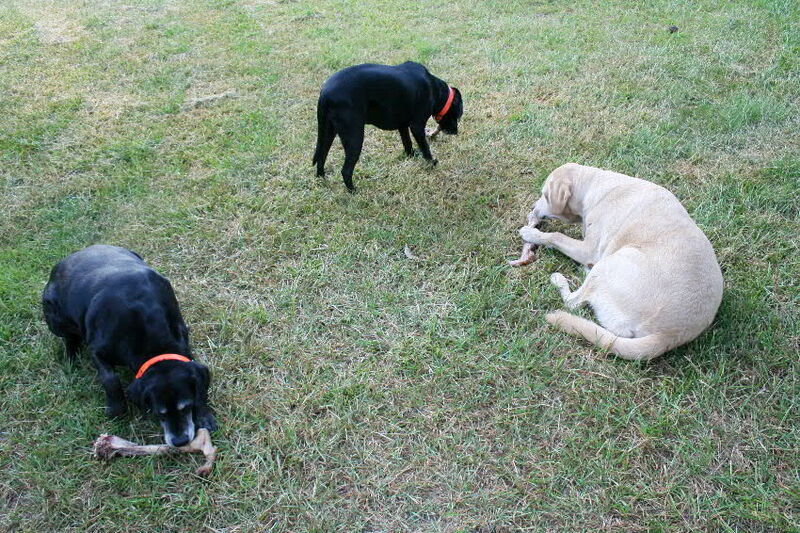 Among her canine duties was helping to raise the younger dogs. There was no need to prolong my personal agony about doing what I knew had to be done or her discomfort. I carried Demeter into the house for one last night, fed her some of her favorite treats, put my digging tools in my truck, loaded a pistol and prepared to put her down the next morning. Although this was a difficult evening, I felt better for having made a decision. Dr. Christine told me that the method that I had chosen to put a bullet into her brain was just as humane as an injection. I felt that this was my job to do. If anyone was going to end her life it was best for her if it was me. She would be spared the trauma of going to the vet, where in her view “bad things always happen to dogs.” Her death would come immediately, unexpectedly in a flash of nervous discharged from a damaged brain. There was blood and mess and her head was disfigured by the impact of the bullet. She fell immediately and her limbs did not move. When I scratched her back one last time, her tail wagged. Although this response was involuntary, I like to think that this was her way of saying good-by. 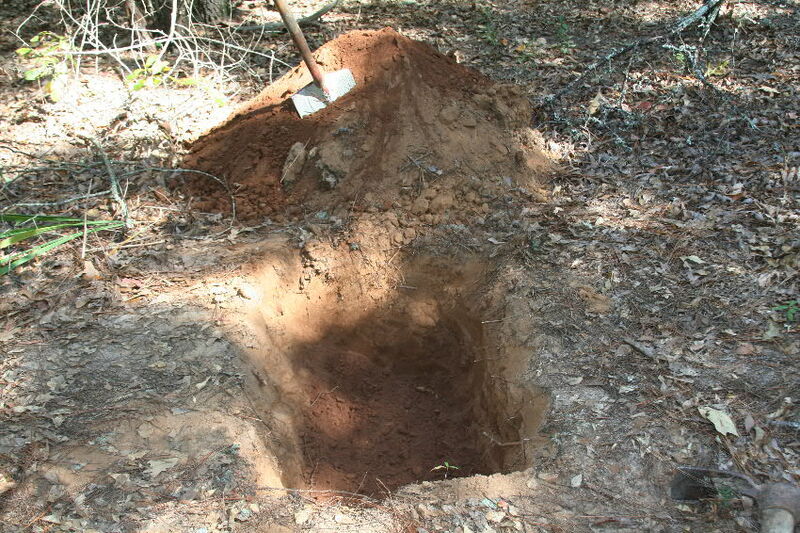 With the grave dug, Demeter’s end was to come a few minutes later. This was in “her” woods, an area where we commonly hunted. In tribute to her as well as to give a visual presentation of this hard-to-take subject, I did a YouTube video of the process which concludes with a shot of her covered in her grave with the last good outdoor sniff she had, a turkey feather, lying on top of her blanket. This video is sad, but not gory or bloody, as was the case in real life. I could have used a smaller caliber gun like a .22 L.R., but I knew from experience that the .44-caliber round ball load from one of my percussion revolvers would be quick, positive and effective, although it did cause more physical damage to her head. This was nothing new to me, a life-long hunter, but would be difficult for kids and less experienced adults. Sometimes death is not a very attractive event. The 3-min video may be seen at: http://youtu.be/BZ0vFevfuHA. 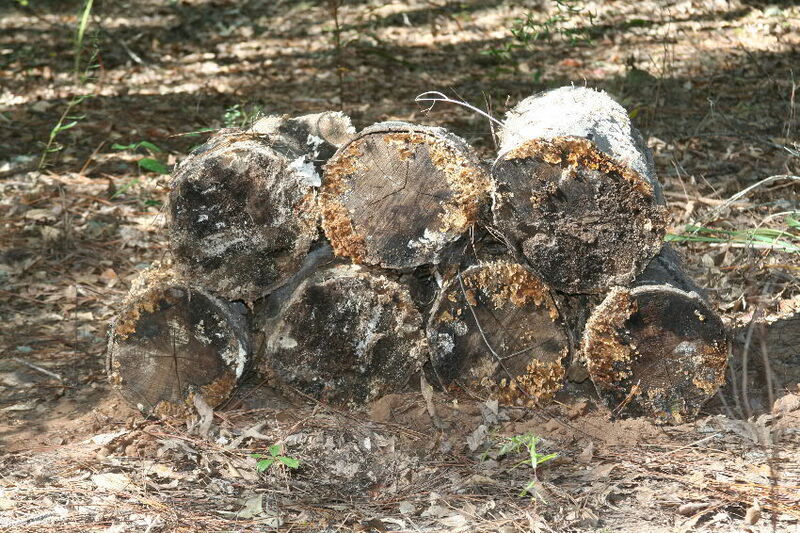 Demeter’s grave with a pile of heavy logs on it to keep it from being dug up by her coyote cousins. 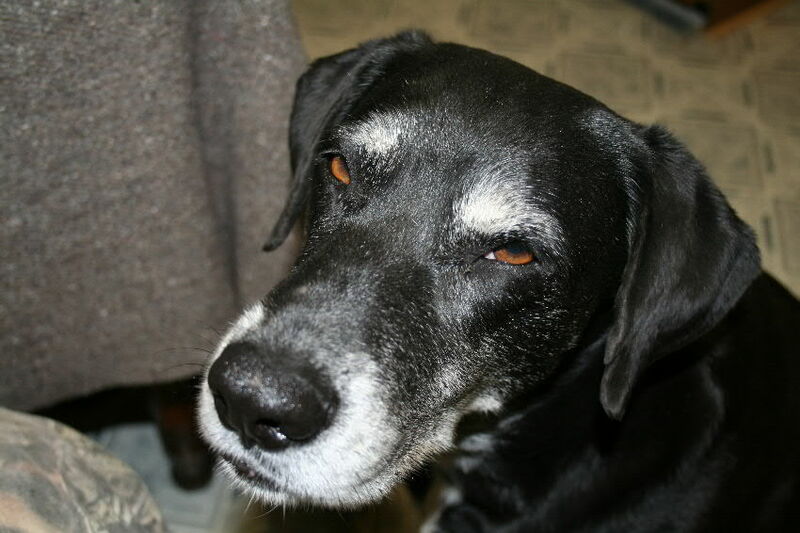 This was a necessary, but unpleasant, act done out of respect and duty to a dog that I loved. This was not easy, but I feel better for having done it rather than thinking about having to do it. My deepest condolences on the death of your beloved faithful Demeter. She was there with you, on your videos using my 240 grain universal bullets to take that fine White Tail Buck and while you made a video casting my 140 grain 36 caliber bullets. her presence enhanced the videos as many people can see a persons inner being by the kind of pets that they keep. I certainly hope that the loving caring Almighty God gives after life eternal with us all with our beloved pets.